Great food doesn’t have to be complicated or difficult. Our philosophy of cooking is simple. First, start with a few carefully selected ingredients, the freshest and best you can afford – not necessarily the most expensive. Second, do as little as possible to them, allowing their natural qualities to shine through. Here’s a dish the illustrates this uncomplicated way of cooking. 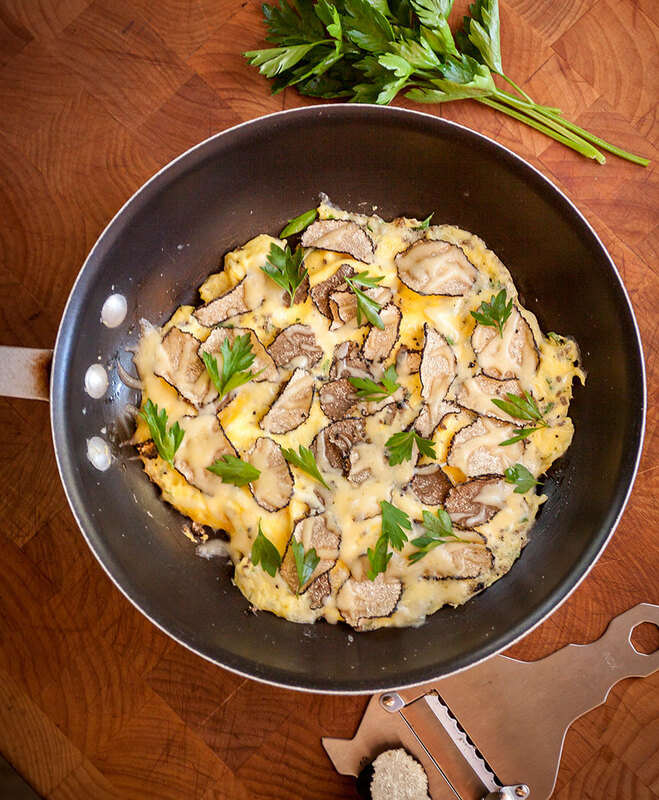 With a fresh summer truffle as the focal point of the dish, and a supporting cast of everyday ingredients – things you probably already have in your refrigerator – you’ve got everything you need to make a quick-and-easy frittata that’s not only delicious, but is also visually stunning. Truffles have a reputation as exotic and expensive luxuries, but the summer truffle (Tuber aestivum) is an exception. 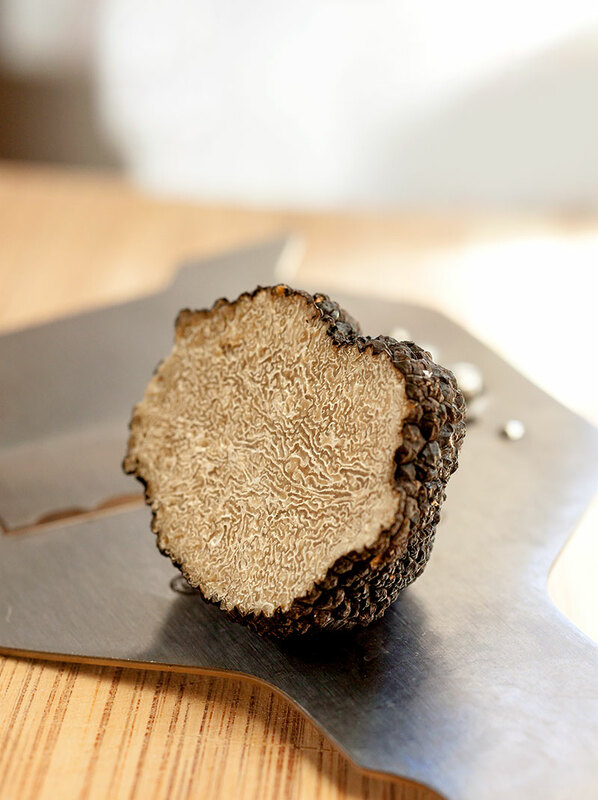 Summer truffles are, admittedly, far less intense in flavor and aroma than the highly prized black winter truffle, but that only makes sense when you consider that summer truffles cost a mere fraction of the price of their expensive winter cousins. Our suggestion? Pile them on! The taste of the summer truffle is mild, but extremely pleasant, rather mushroomy in character, but with a little something extra – something slightly mysterious, something… truffley. 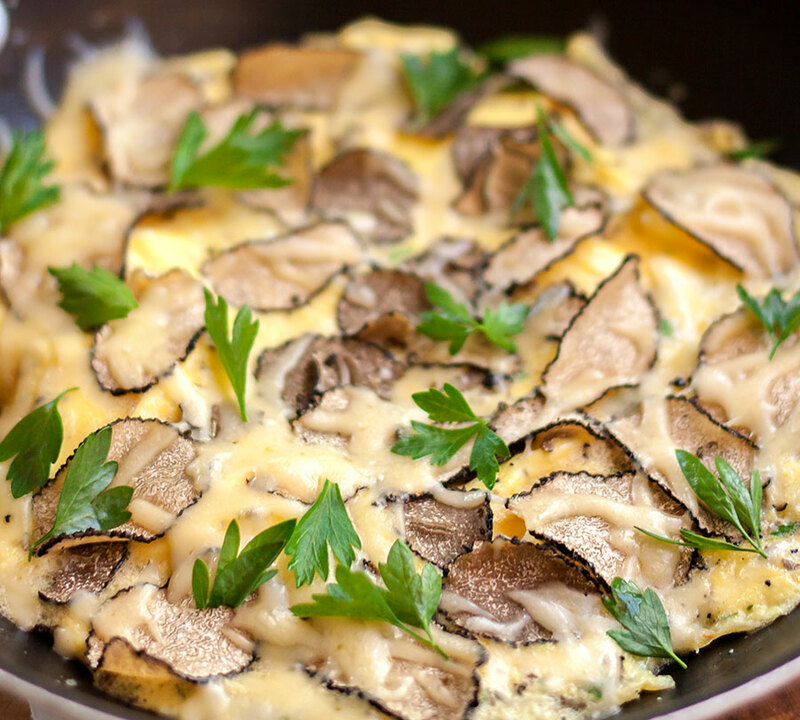 The gentle flavor of eggs is particularly suited to show off the subtle nuances of truffles of all kinds. This recipe makes one very simple frittata that is perfect for sharing. You can add more ingredients if you wish, as long as nothing overpowers the delicate flavor of summer truffles. When in doubt, add more truffles! Heat a 10-inch non-stick pan over medium-high heat. Add the butter. Crack the eggs into a bowl and add the milk and a pinch of salt. Beat well with a whisk or fork until foamy. Finely dice 1/4 of the truffle slices and stir into the egg mixture. When the butter begins to bubble, pour the egg mixture into the pan. Reduce the heat slightly. When the egg begins to set, lift the edges with a heatproof spatula, allowing the uncooked egg to flow under. When the bottom is just barely set, and while the top is still quite moist, remove the pan from the heat. Sprinkle about 2/3 of the grated cheese over the eggs. Quickly spread the remaining truffle slices evenly over the top. Sprinkle with the remaining cheese. Slip under the broiler until the cheese begins to melt and bubble and the top of the eggs are set, but not browned. Strew a few torn parsley leaves over the top, divide in half and serve immediately. We like the subtle flavor of summer truffles just as they are, but if a stronger truffle flavor is desired, drizzle with a few drops of good quality black truffle oil.